Last year, we finished our Easter Parade video too late to include it on our Easter Sunday blog, so we thought you'd enjoy it today. Pawleez check ON PICTURE to access video! You'll be glad you did! So we cats decided at the last minute, we MUST see OTHER CATS WITH HATS! 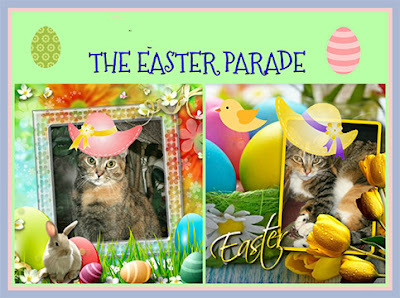 So we made an offer to our Facebook readers they could not refuse: Volunteer for our Easter Parade and your Cat will get a NEW HAT. Click HERE (Or on the picture) to see the colorful resulting SHORT slideshow! Note: We originally did our blog post a few days after Easter last year,but thought this year you'd enjoy seeing it more AHEAD of time! We plan to join Athena and Marie's Caturday Art this weekend and the Cat on my Head's Sunday hop. Want to visit even MORE animals? Here's yer chance! Wishing all our furred friends a wonderful Easter or Passover holiday. That was some serious hat fun! that was a lovely video. How very neat, the girls are very sad they didn't get an Easter Bonnet this year. We will have to try to take part next year. We found you (but not via the Cat on my Head!) Have a great Sunday you girls! Wow thanks for letting us know! this is what happens when you try to type at 1 in the morning! Thank U Speedy. I think we must done that link in tha middle of tha night! We are on our way to visit YOU! Happy Easter! We love cat and hat pictures!! Happy Easter from the Zee/Zoey gang. That was a fabtastic video presentation and everyone looked delightful in their bonnets and ears. You always make such fabulous videos! Happy Easter!